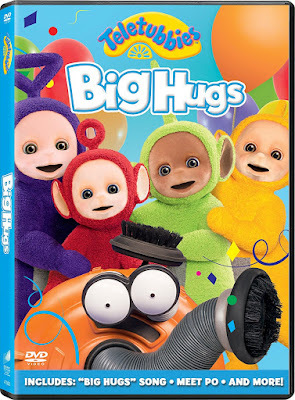 Families everywhere can ring in the new year with the Teletubbies and TELETUBBIES: BIG HUGS on DVD now from Sony Pictures Home Entertainment. Timed perfectly to “International Hug Day” on January 21, the six all-new episodes feature Tinky Winky, Dipsy, Laa-Laa and Po as they splash in puddles, ride the Custard Train and watch Tummy Tales together. TELETUBBIES: BIG HUGS includes three behind-the-scenes featurettes: in the first, fans can join the Teletubbies as they sing their all-new song, “Big Hugs”; everyone can learn more about the adventurous red Teletubby, Po in “Meet the Characters: Po” and; viewers are introduced to Daniel Rigby, the new narrator and performer of the Teletubbies theme song. The Teletubbies love to make new friends and they love big hugs! Join Tinky Winky, Dipsy, Laa-Laa and Po as they splash in puddles, ride the Custard Train and watch Tummy Tales. Episodes include: Making Friends, Watering Can, Up and Down, Favourite Things, Babies and Hiding. TELETUBBIES: BIG HUGS has a run time of approximately 74 minutes. The collection is not rated.